This walk: 2011-6-22. Little Staple Tor, Middle Staple Tor, Great Staple Tor, parish boundary stone (Whitchurch/Peter Tavy), Roos Tor, red flag, stone markers, Duke of Bedford pillars, Cox Tor, Beckamoor Dip, sundew insectivorous plant, old Sortridge and Grimstone Leat. 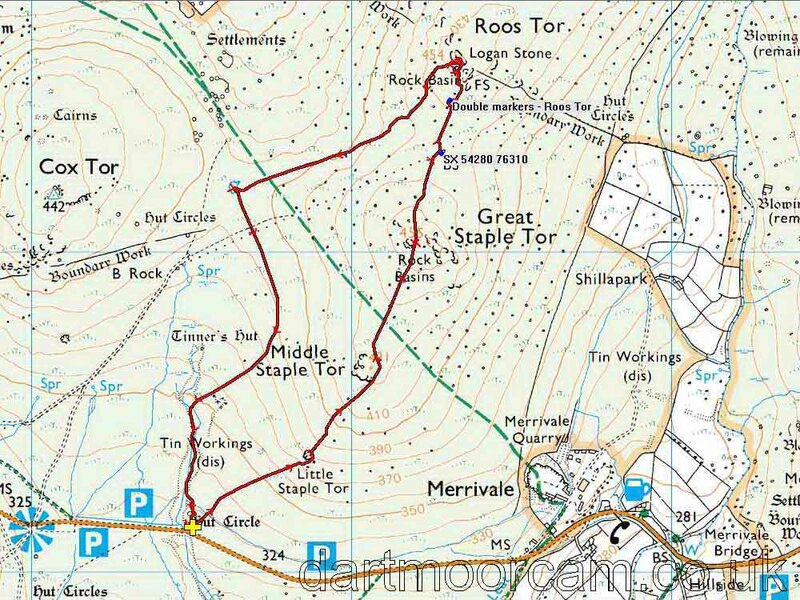 Followed by Great Staple Tor, SX 542 760, elevation 455 metres (1492 feet). "P" (Peter Tavy) on the other. The then Duke of Bedford had each marker itself marked by a granite pillar so that there could be no excuse. Source: Dave Brewer (2002), Dartmoor Boundary Stones, Halsgrove, p.251. Zoomed view to Cox Tor, SX 530 761, elevation 442 metres (1450 feet). Looking north-east towards Higher Godsworthy, it appears that the cloud was lifting. Great Staple Tor from the north. Gathering at the red flag .......... where we should be safe? Moor Strollers find a logan stone - it did move although it might have moved more if they could have all been on one end rather than some being so near or even over the fulcrum? There are at least two markers out there, in the mist (near-central and half-way to the left edge). Beckamoor Dip, the pond below Cox Tor. Another pair of marker stones, close together. See, the sun DID shine - over there! Yet another view of Great Staple Tor as we walked around "the back" of it. Roos Tor Pits: "tinners' trial pits : ...... consists of a discreet E � W tinwork with evidence of a probable adit, shafts, lode-back pits (i.e. lines of pits dug directly into the tin-bearing lode) and three reservoirs on it�s south side. It is a good example of a site with a characteristic range of features ���.. no obvious buildings recorded although one or two levelled areas may have been foundations for temporary huts. No leats leading to the site have yet been traced which remains a puzzle.� This is an extract from the Dartmoor Tinworking Research Group newsletter No 13, July 1997. Berni said "He always could walk on water!" At last, a clear view of Great Staple Tor. A pretty picnic spot up the gert ("Tin Workings" on the map) near the car park. Sundew ..... is that bits of fly on the right, not digestible? Sundew, a good view of the hairs with sticky tips that curl over and trap any insect unfortunate enough to wander inside the flower. A twisted tree in the gert - they don't live outside in the open around these parts! Then it rained stair-rods again, just as we got back to the cars! Atmospheric view to the south/south-east. Pointing out the present course of the Sortridge and Grimstone Leat on the hill opposite, with the original course right in front of us. Vixen Tor, SX 542 742, elevation 317 metres (1040 feet). This walk was reached by driving past Merrivale from the east and parking in the second quarry car park on the right, marked by the yellow cross on the map.